We are so pleased to introduce our debut collection and new partnership with Patrick Lose! Patrick, a quilt industry veteran, prolific fabric and pattern designer, and celebrated author, announced the launch of his new fabric company, Patrick Lose Fabrics, at Houston Quilt Market this past Fall. After 23 years of designing for other companies, he felt it was a natural next step. We adore Patrick’s impeccable style, his creativity, and, above all, his love affair with color! Basically Patrick – A Quilter’s Rainbow is set to be the cornerstone of his new venture, so it seemed only fitting to showcase those colors in his debut Aurifil thread collection, Basically Patrick. We’re excited for all that is to come and can’t wait to share all things Patrick with you throughout the year! I’m probably a pretty complicated person to answer this one because I have so many and varied interests but one thing that makes it easier to describe myself is that I feel that most of my traits stem from being creative. So I guess I’d call myself a “creative”. I usually look at things around me with a creator’s eye and mind because I’m always catching myself trying to figure out how things are made or how something works or what was going through that creator’s mind as they worked through their own process. In all honesty, I feel like I’ve had many because my creative personality is also a curious one and I’ve tried lots of different things. I was bit by the theatre bug in high school and I’ve worked as an actor/singer and costume designer alongside any other job I’ve had. I’ve also worked simultaneously as a florist, graphic designer, illustrator, teacher, and fashion/bridal designer to name a few. I remember it well but probably not for the best of reasons. I’ve always loved log cabin quilts and decided to make my own version and really enjoyed the process until it came time to quilt it. It was a large throw size, maybe 60 inches square, and I decided to try my hand at free-motion quilting on my domestic machine at my kitchen table. It might have been okay if I hadn’t decided to do a loopy meander over the entire top, with none of the loops larger than about a half inch diameter and spaced an inch or two apart. I thought I would never finish it and I also thought I would never quilt again when I finally did finish. But I sure got over my fear of free-motion quilting fast. ‘Integration’ by Patrick Lose, Quilting by Jessica Gamez. You’ve just launched your own fabric company, Patrick Lose Fabrics. What inspired the shift and what excites you most about the resulting new collections? I can’t even describe how excited I am to be at this point in my career. It’s like it’s all new and every day there’s something even more exciting to work on or experience than the day before. I always enjoyed being a designer for someone else’s fabric company but I’ve been doing that since 1993. There were always limitations to the number of collections or designs I could put out in a season, though one of those companies, in particular, had offered me lots of freedom. Now I decide for myself how much I want to produce and I’ve never been more prolific in my entire career. I just feel like the sky is the limit and I’m investigating so many opportunities now that the companies I worked with in the past weren’t able to offer. I really feel as though the work I am doing now is the best I’ve ever done because of this freedom I’ve been fortunate enough to achieve. What is your favorite quilting technique and why? There are so many, but I design and make lots of appliqué projects because it’s a way for me to put my illustrations and characters into my quilted pieces. The fans who follow what I do, especially in appliqué and machine embroidery have been so loyal and I try to offer them lots because it’s a smaller niche audience that doesn’t alway get the attention it deserves in the industry. I’m pretty sure I was already using Auriful thread when I opened my first studio in 2010 and I’ve been a fan for as long as I’ve used it. Color is my “thing” and, maybe because I love working with all colors, it’s really impossible for me to pick a favorite. Those who know my work would probably be surprised to hear that some of my all-time favorites are Aurifil’s neutrals and I love using them in 50 weights for piecing. But, if I have a color on hand that is an exact match for what I’m piecing, I go with that. That’s why I love having so many Aurifil colors at my disposal. I love the range of colors Aurifil produces! I wanted our customers who use my “Basically Patrick” collection of blender basics to have a great starter set of colors that coordinate well with the palette of the fabrics. Of course, you can’t have too many colors of either “Basically Patrick” fabrics or Aurifil threads so we’re working on another collection to coordinate with all of the new prints and colors that are constantly being added to my collections. What excites you most about your partnership with Aurifil? I love the fact that so many of my customers already use Aurifil threads and are always asking me for the specific threads and colors that I use in my projects. Now I can have them assembled all in one place for them! Although I enjoy traveling, one of the things I’m loving most about the launch of Patrick Lose Fabrics is that I’m getting lots more studio time for designing – whether it’s drawing and painting or digital design. I’m also spending more time sewing and quilting and that’s been a luxury I didn’t have as much time for in recent years. So, I imagine it will be easiest to find me in my studio in 2017 but we also have a Party with Patrick at Sea cruise next month that I’m really looking forward to. 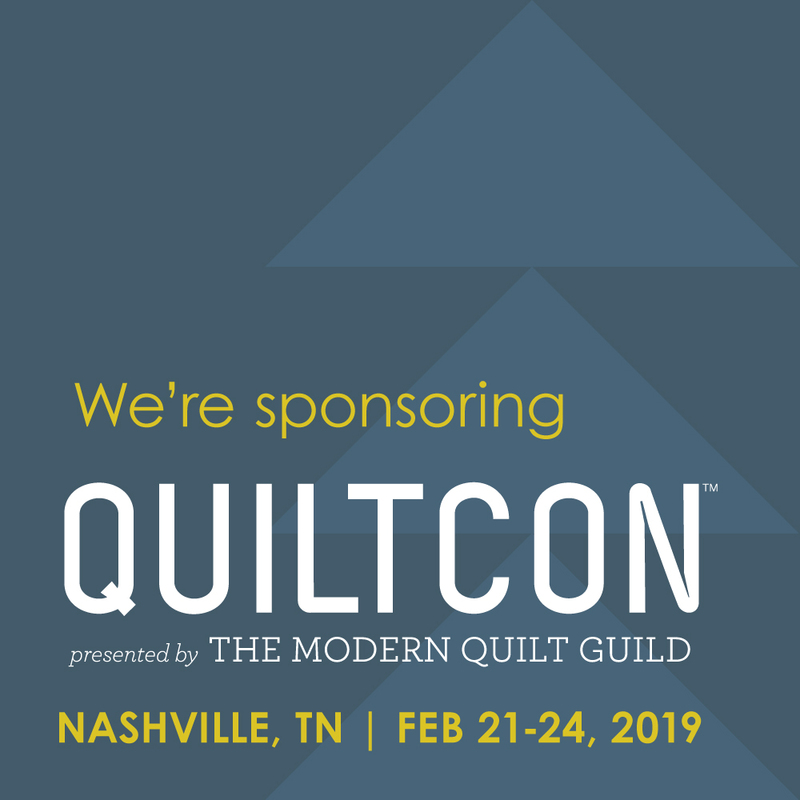 We’ll be spending 10 days in the Caribbean with a really fun bunch of quilters. Every summer I head back to my hometown of Des Moines, Iowa for the truly-awesome Iowa State Fair, where I help to judge the quilting, garment sewing and machine embroidery competitions and teach classes for 11 days in the Fabric and Threads Department. If you have a chance to join us there, I can guarantee you’ll enjoy it! The fair runs from August 10-20. To enter-to-win 1 Large Bascially Patrick Thread Collection and one Basically Patrick “Land and Sea” Bundle of Fun™ (20 Fat Quarters! ), click here to head to the Rafflecopter entry page, or simply click on the image above. You do not have to complete all the options to be entered but the more options you choose, the more entries you have! Entries will be accepted from now through 11:59pm Eastern Time on Saturday, February 4. Winner will be randomly selected and announced here on Sunday, February 5. Giveaway is open to our international friends! Good luck! A renaissance man by the very definition, Patrick Lose has spent his entire professional career being creative in one medium or another. 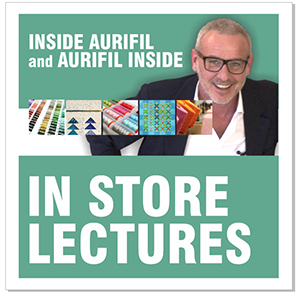 An accomplished actor, singer, artist, illustrator, award-winning costume designer, author, fabric designer, pattern designer and outside-of-the-box quilter, Patrick is always looking for new ways to inspire and bring color to the world around him. “When I sit down to doodle at the drawing board, I never know what one of my designs might become.” Whether it’s unique fabric prints, quilts, clothing, stationery products, or home decor, he enjoys creating it all. Patrick is well-known for his playful novelty designs and colorful trendsetting basics, which he’s created over the 23 years he’s spent designing cotton fabric collections for the industry’s leading companies and, now, for his new company, Patrick Lose Fabrics. As an author of dozens of quilting and crafting publications, Patrick generously shares so many of his creative endeavors. Revered by quilters for his unique method of mixing traditional piecing with contemporary applique techniques, he focuses on creating a variety that attracts quilters of all ages and styles. His quilts, crafts, clothing, and home decorating accessories have graced the pages of such distinguished magazines as his own Quilting Celebrations!, Better Homes & Gardens, American Patchwork and Quilting, Country Crafts, Christmas Ideas, Halloween Tricks & Treats, Love of Quilting and many more. Always proud to be a longtime friend of independent retailers, Patrick’s fabric collections, books and patterns can be found at your greatest source for inspiration – your local independent quilt shop. Check out Patrick’s guest appearance on The Crafty Planner’s podcast here. These colors would look fantastic in my family room, so a new lap quilt it would be. I am getting ready to start a new BRIGHT quilt for my 6-y-o daughter and I hope to make something that she’ll love for many years to come. Soory, did not answer the question the first time. Probably a lap or baby quilt! Love the colors. These would make great blenders. I would make a modern-style rainbow, end to end spectrum type quilt with one neutral background… I absolutely love the values of Patrick’s thread collection and the basic fabrics. They are perfect for me! What wonderful colors! Would be perfect for a fun lap-size quilt for a preteen niece or two. Thanks! Love Patrick’s fabrics ~ and I REALLY love the threads! Thanks for the chance ~ fingers crossed! BTW – I’d make a quilt for our new grandbaby! The basics are very colorful and not at all basic! I like them. What fun colors! These would be great in a quilt for my niece’s family. I would like to make a table runner or wall hanging. A lap quilt for my grandson. I really like the many shade variations of his colors and would make a quilt highlighting them. I think it is great that Patrick started his own fabric company. Nothing like freedom to ignite the creative powers! I especially love Speckles of the group and can’t wait to find these in my LQS. I think some type of rainbow spectrum quilt would showcase this group the best. A great variety of colours! I love to make my quilts with all the colors of the rainbow, probably something with stars. How exciting! Congratulations Patrick – loving the color and creativity of your new line and thread collection. I Look forward to learning more at Spring Market. What a lovely rainbow of colors! Can’t wait to see these in LQS and quilt with them! Beautiful line. Absolutely love the colors, especially love the quilt! Love the colors, I would make a quilt or two. Love the colors and variety of textures! I would make a rainbow zigzag quilt and then a rainbow plus quilt. Looking forward to the chance! Great fabric line. I’d like to make a churn dash quilt. Love the bright colors — would make a lovely quilt for one of my grandchildren! I have enjoyed learning Patrick’s applique techniques and love that he started his own fabric company!! Not sure just what, but I love these blendables. I would make a quilt. I love Patrick Lose! My daughter just asked me to make a large (king size) quilt with the ‘Ombre’ effect. Fabrics gradating, I was a bit daunted by the pattern and colors she chose. Royal, navy, light blue, turquoise, gray and mint (no white) Now with Patrick’s new line I think I can find what she wants. I’d make a wall hanging with those beautiful colours. Found you! As I was saying, I love your colors, Patrick, and the way I can use your fabrics as my solids in my quilts. Thanks for continuing to be so creative. I love your Integration pattern! Very colorful. Lov eyou, too Aurifil threads! I would use a rainbow of fabrics to make an offset HST quilt. I love Patrick Lose fabrics and patterns and have been a fan for a very long time! What a beautiful collection! Would love to win! I’ve been wanting to make a quilt with rainbow flying geese in a swirl. Would love to use these fabrics my mixed media fiber art projects. I would make a lap quilt to brighten my family room until one of my grandchildren claims the quilt. Such beautiful colors, they make me smile. When someone asks my favorite color, I say anything Patrick Lose! So many to choose from, I don’t have one favorite! I would start making some simple modern quilts with those lovely brights for upcoming babys. I love that one above in the article…just a pop of color on a neutral mod background…love it! I need to make new baby quilt for my new grandson being born in June! This would be my project! What an awesome collection! I’d love to make a Sampler quilt with these wonderful colors! Fingers crossed. definitely a match made in heaven. thanks for the chance to win. I would like to make a really modern quilt with these fabrics, thank you for the chance to win! Fabrics would be great to compliment an I-Spy quilt for our first grandchild. Congrats to Patrick on his new venture! I would definitely make a tote to show off these beautiful colors and maybe a top to go with my tote. Thank you for a chance to win this. Pretty thread choices for your basics line. You are right when you say most of your customers already use Aurifil thread already. An improv wall hanging of trees. Love the colors! I would make a small modern quilt – maybe with some flying geese in it. I would make a butterfly quilt. love the colours. Congratulations to Aurifil and Patrick Lose. Loved learning more about Patrick and his fabrics/designs. Heading to his Instagram now! I would make a rainbow quilt. Such a beautiful range of colors…the sky’s the limit for projects! Patrick, Congratulations on your beautiful rainbow collection . With it I’d love to continue my skill building w/FMQ, on neutral fabrics. Turn into fabric baskets w/warm wavy lines in the red,orange,yellow. Table toppers stitched in the cool colors in your collection…Thank you. My favorite go to colors! I would make a quilt though not sure what. Maybe some sea life appliqué? Perfect fabric for an ocean theme. I love Patrick Lose fabrics and Aurifil threads. I would make a quilt for my granddaughter who is graduating from high school this year. She would love those colors. Beautiful collection. Thanks for this wonderful giveaway. Gosh, love all the colors and texture of the fabric. Would love to make a quilt with a rainbow of colors…not sure exactly what yet. Love to make a thoroughly modern quilt with a rainbow of your colors, if I am fortunate enough to win. Good luck everyone. I would start off with a hot air balloon wall hanging. The bright colors also are calling a spring floral applique table runner and placemats. A pillow for the living room would just set it off. If I won this giveaway, I would make an applique wall quilt with one of my embroidery collections. These are such beautiful colors! A rainbow pallet has always been my favorite colorway. I think these colors would make a lovely rainbow quilt with the colors grouped warm to cool in a diagonal style. Thank you for the opportunity to win this great prize and good luck to Patrick in his new venture! Loving the saturation of colors. Yummy addition for anyone, thank you for the opportunity! I love Patrick’s bright colors. The possibilities are endless. However, I have a very creative 16 year old daughter who has made one quilt, well almost finished, and I think I might challenge her to come up with a design for this rainbow of fabrics. They would be right up her alley and another way to spend some quality mom/daughter time. Wow! Love the colors! Actually anything could be made with this fabric. I am thinking friendship stars with a white background so the stars pop! I would use it for a large quilt. Love the colors and patterns. I’d love to make a Rainbow quilt if I were to win a bundle of Patrick Loose’s fabric with matching Aurifil thread!!! That would have to wait till I finished my “happy dance” first! Thank you so much for allowing us a chance to win such beautiful fabrics!! I’m not sure, at this point, what I’d use them on, but I could almost guarantee a black background. I love how the colors pop against black, and know that whatever I made would be beautiful because of the beautiful colors!! I just love the vibrant colors Patrick has designed. Brights are my thing I just love them! Patrick’s thread collection fits the bill..
What would I sew with the rainbow collection? A rainbow of course. I have been using the rainbow and color wheel for a lot of my quilting lately. Love this collection. I would make a throw quilt with those beautiful colors. What would I sew – a table runner, a kids quilt, crafts. I have always loved the bright, fun colors in Patrick’s collections and am excited to have Aurifil matching thread. This is a match made in “color” heaven. Love all the bright colors with little patterns in your line. I enjoy applique and these are going to be so nice to use. I Love Patrick’s fabrics & patterns! I can think of a million things I could/would make! I would probably make a birthday wall-hanging for my youngest granddaughter first though. Her 1st birthday is coming up soon. I’ve always loved Patrick’s style of quilting patterns. I’m glad he now has his own fabric company. I love using bright rainbow colors for quilts and table runners. I’m going to be quilting a baby quilt soon, and these colors would work so well. Thanks for the info about Patrick. Such beautiful colors! I would use them in a quilt. Thank you so much for the chance. love the bright colors and vibrant designs! I hope to find a shop that carries them. I would make a rainbow quilt with this beautiful collection. I would make the Triangle Transparency quilt by Quilting Jetgirl. So many things to make, so little time. Quilt would be the thing I would make. For the scraps, I have in mind a seascape mini quilt with a lighthouse. Love the new fabrics. Would make the most beautiful quilt ever! I would love to make a rainbow Dresden! I would make a quilt for one of my siblings. Would make a nice and cheery quilt for this dark winter!!! These fabrics and threads would make a happy baby quilt, a cheerful table runner, great tote or bag. Love all of the colors! Thanks for the chance to win and interesting post. What a great new collaboration!! Love the colors of the fabrics and the threads. I am thinking a table runner for the spring / summer months would be fun or a tote bag to carry treasures from my local quilt store or treasures from the monthly flea market. I L.O.V.E Rainbows an Sunshine(my daughter’s names)! These prints and threads will make perfectly colored gifts for them and a”few” pretty gifts fir myself! thanks for the contest and Great Products! This is so exciting! I’m looking forward to some beautiful fabrics. I’d make a quilt with Basically Patrick’s colors. It’ll be beautiful! Love this new line. Fantastic! These fabrics would be perfect for the rainbow quilt I’m planning. Love the fabric and thread. What an awesome giveaway. Thanks. I would love to make rainbow zippered pouches with these fabrics! Those colors are beautiful. I little while ago I bought a piece of fabric that has the alphabet and pictures scattered over it. I want to cut them out and make them the center of an improvised log cabin. I am collecting fabric for the logs now, and this fabric would be perfect. This would make such a happy, bright and cheery quilt. Congrats Patrick, love your colors. BEAUTIFUL COLLECTION! I’D MAKE A NEW BED QUILT ! I love Patrick Lose fabrics and Aurifil threads! Aurifil is the only thread I use for piecing! Such gorgeous colors would make a beautiful quilt! Love the vibrant colors! I think I would make something for my mom. I would do a bargello quilt if I won the rainbow fabric and thread. Thanks for the chance to win. I would sew a lonestar wall hanging. The bright colors would be perfect. Beautiful vibrant colors. I love the way they blend. What would I quilt? One of everything! Quilt for my lovely daughters, sons and my best friend! I will be heading to your new store! I love all those colors. I would have to make something with an ombré look to make use of all the different values in his colors. I would love to make a bright and cheery table runner for my mom. A quilt, maybe for a baby?? These fabulous colours would make a terrific quilt for my niece who just started university. I love these gorgeous colours! I want to make a Feathered Star wall hanging with Patrick’s fabrics. I would make a thread wall cover! What beautiful, rich colors in the fabrics and the gorgeous Aurifil thread. Thank you for a chance to win. I would make a rainbow-rich quilt for my newest granddaughter. Good luck, Mr. Lose, on the launch of your new company. Gorgeous colours in thread and fabric. Would make some gorgeous baby quilts . Great blenders, that read as solids. Would be fun to make a star quilt of some kind. I would make a quilt for our new baby, due to make an appearance in July. Your fabrics are the colors I plan to use for my next quilt…a yellow/green/blue triangle design! Thank you. Congrats Patrick!!!! Love the colors and I love Aurifil thread. Don’t forget judging food at the fair too! LOL!! I have a notion to create a unicorn riding a rainbow. I will use Patrick Lose Basically Patrick fabric and the new Aurifil Thread to make a beautiful rainbow quilt, of course! be lovely to create something colorful and cheery. Patrick’s threads and fabric are bright and happy. I hope my local fabric store carries them. This collection of fabrics would help make a colorful quilt. I absolutely love this selection. I would love to make a rainbow log cabin quilt. I love all of Patrick’s fabrics. I would love to use these in a quilt! Can’t wait to see these in stores! Patrick’s colors are beautiful! I love the many tutorials of his I’ve seen, especially his appliqué techniques! I just love everything Patrick does. Really liking those beautiful colors. I would make some children’s quilts. I love Patrick Lose and Aurifil. I would like to make a baby quilt in a zigzag chevron design made from the Basically Patrick line. This line is a fabulous add to my addiction. I’d finally get around to making a quilt for my Mom! I’m undecided what to make — I’m sitting on a fat quarter bundle that I won’t open until I have a plan. Love Patricks patterns and those fabrics are my favorite colors, definitely would make a lap quilt. Gorgeous fabrics and colours!!! I’d love to make some baby quilts.. I would love to do a rail fence quilt with this line! I would make pillows for my color-loving daughters with these stunning fabrics and threads. Wow, sure do love the brilliant colors! With those colors I could sew forever. Love them. The colors of Land & Sea would be perfect on my grandsons bed! I love Patrick Lose designs and fabric collections. This collection of fabrics and threads are perfectly matched and so cheerful, that it would certainly be fun to create with them. Color strata quilt or rainbow bagel lo quilt. Thanks for the chance! Patrick Lose is one of my favorites! I’d make lots of mug rugs, table toppers, wall hangings, and lap quilts using machine applique and some machine embroidery so I could have fun actually completing projects with all those beautiful colors. Absolutely love working with the fabrics and patterns. Your colors are always so cheery & clear. I love them all. I am a fiber artist and just found you. I love all of your blenders. Your fabric would work great on a series of cat wall hangings that I am working on. I love the colors Patrick uses, and they are perfect for all of his designs, several of which I have the patterns for. The colors are so clear and wonderful! I would make my new grandson an appliqued baby quilt. Thank you so much! I would love to make a series of seasonal throw pillows for all the rooms of my house! What beautiful fabrics & threads, The colours are just gorgeous. Brings all kinds of ideas to mind. Thanks so much for the opportunity to win these. Congratulations on your new partnership. I would make a quilt featuring all of these colors — so beautiful! I’d love to use these rainbow threads to make a quilt with either Patrick’s wonderful fabrics or a collection of rainbow ombré fabrics. If won your rainbow colors, I’d make a quatrefoil quilt, or a swoon block quilt. These patterns lend themselves to your beautiful colors! I love how your fabrics are blended or tone on tone, and can be used in so many ways! I have used them in your mini quilt of the month patterns that I purchased last year, and love how bright and cheery they are! I am sure I would make some kind of quilt. Maybe a small Twisted Log Cabin or an Art quilt for the wall. I’d make something beautiful for my beautiful granddaughter! Such lush colors and what an awesome array of thread colors! These colors are perfect for my family room and I think I would like to make some type of sampler quilt with these. I am also a big fan of applique. I would make a quilt for my son who justed moved out in his own flat! Would make quilts for famiky an friends. Love the bright fun colors he creates to add so much interest to my quilts! Such beautiful colors! My 5 year old granddaughter loves to go through my stash and pull out the brightest colors to make a rainbow. These fabrics would make a gorgeous quilt for her. I love to use Patrick Lose fabrics in my quilts and bags. I’ve been a fan of his fabrics for years and it’s exciting that he now has his own fabric company and has coordinating threads. Fabulous! I would make a beautiful rainbow quilt. Love Patrick’s fabric and the thread to match. Congratulations on the new venture! I love Patrick’s fabrics because of their vibrant colors. One of my favorite quilts of pinwheels is made from Patrick’s earlier fabrics. For this new series, I think I would make a tablecloth or placemats. Love those colors. Sure hope my LQS carries this line. The colors and fabrics are amazing! It’s like opening a new box of Crayolas in third grade when we got to use the “big” boxes. I always enjoy making Patrick’s projects and using Aurifil. I’m thinking something with black and white and ALL those beautiful fabrics! Wonderful colors and beautiful fabrics and thread. I enjoyed reading this post . These colors and prints would be fabulous for bargello quilts! Thanks for the chance to win! I am currently making a Positively Perfect Nap Quilt (from Moda’s bake shop) with a rainbow of one of his lines – Suds! 🙂 I’d also like to make a gradient nine-patch. I love rainbow “blenders”! Gorgeous fabrics! They would make a very beautiful quilt. I’d love to make a big rainbow spectrum quilt. These bright blenders would be perfect for it! What could possibly be more awesome than to win two of my most desired products!!!! A dream come true!!!! I’d need to make a rainbow quilt so that I could use all of Patrick’s beautiful rainbow colors to quilt it! QUILTS!!! As in plural. I love brights, I love tone on tone designs to use as solids. Gives quilts more life! Thank you for the chance at a great giveaway. Love Aurifil! Gorgeous colors and fantastic giveaway – i’d make a quilt for a good friend of mine!!! I am actually working on a Mini quilt right now with a charm pack of Patrick Lose’s basics. It is so cute!! What a great combination: Aurifil thread and Patrick Lose fabric! I am working on a quilt for one of my sons with some of Patrick’s fabrics. Love the rainbow colors for making children and baby quilts, so bright and cheerful! I love the colors! I would work on a wall hanging of a seaside or lakeside scene. I love these colors and Aurifil thread. I really like the quilt that looks like it is hanging in Patrick’s booth – the one with the multicolored arrowheads. I would make a yellow brick road quilt. Love your quilt mat designs and your bright colors of your fabrics inspire me, so happy. Congratulations on your new company! Love the colors. Trip around the world maybe or a very modern one. Thanks for the giveaway!! I’m collecting fabrics for a Storm at Sea in brights and whites. This pack would be perfect! Wonderful colors. So many things to make and many of them would be wonderful with these basics. I would love to make a quilt with these beautiful colors!! I would love to make a quilt and some pillow covers with this fabric line. It is awesome! Thanks! I would sew a quilt, of course. Love working with bright colors. I’d sew to my heart’s content. I have a few Grandkids that would like something made by Grandma! I am thinking pouches for whatever they want to fill them with. I love the bright colors…and try to use them often. I simply love to applique’ animals for children’s charity quilts. I love the fabrics you create and would love to have some more of them. Any bright color is good, they are all my favorite. They work up wonderfully in children’s quilts and everyone always loves the colors. I have your very first book that is how big a fan of yours I am. Keep up the beautiful work. Thanks for the giveaway. Thank you so much for the interview. I’ve been using Patrick’s fabrics probably since the beginning, or very close to it, every time I wanted those lovely brights in a project. For years, I hoarded every little scrap! I’m so excited about the new company and the variety of colors, as well as the Aurifil thread box! Thank you for the chance to win my own set of fabrics and threads. Such lovely colors! I would make a water themed quilt. Something reminiscent of summer lakeside vacations. I would make a super sweet and cheerful quilt for my latest grandbaby on the way. A quilt for MY bed! Beautiful collection. Floor cushion for our oldest grandson with lots of colors. Beautiful colors and fabric. such a lovely collection. I would make a happy baby quilt. I would love to make Patrick’s Integration quilt. The fabric and thread colors are gorgeous. I see Patrick Lose fabric in my stash soon! What a perfect relationship – Patrick’s fabric and aurifil thread ! This is definitely a picnic quilt for ME ! Love your awesome colors. I would make a pinwheel design quilt. I enjoy using your patterns and other designs. Thank you for sharing your endless creativity. I think they would make a fantastic baby quilt. Love the colours! Baby quilts are always fun to make! Love the bright colors and the Aurifil thread to go with them. I use Aurifil almost exclusively for piecing and other sewing projects. Would make beautiful table linens – placemats, napkins, table runner – for patio parties. Love the bright colors! I would love to make a quilt for my daughter – she would love the colors! Love the rainbow colors! I’d make a chevron quilt out of that fabulous collection of fabrics! Love these fabrics – the bright colors and the patterns! This beautiful, bright thread would be great for stitching up my favorites…..black and brights! Yummy colors, perfect for this quilt I am planning in my head that is full of curves! I love these colors, and have been buying Patrick’s designs for years. I would definitely use the fabrics in quilts for kids, and use the threads for quilting them. Home run, I love these new fabrics…I’ve been doing improv lately so I’d incorporate them into a new creation! I’d make a rainbow of quilts! I would make a Jaybird Quilts: Night Sky and Daybreak quilts! I love the tone-on-tones in rainbow colors, and they would be perfect for all the contrast and graduated colors of Jaybird’s designs. I think it would make a darling little boy quilt! Beautiful fabric! I would love to win this fantastic giveaway. I’m about to embark on my first applique project. It is leaves of every color. This assortment would be perfect! Patrick’s fabrics are gorgeous, so of course I’d be making the most awesomely beautiful quilt you could imagine! Thanks for the chance to win such a fantastic giveaway! I would make a cathedral window with all these beautiful colors. I would love to have the variety of colors to go with the Basically Patrick fabrics I own. I would love to make a brightly colored quilt for my next project! Love all those colors! I would make beautiful quilted and appliqued projects with this awesome giveaway. It’s sometimes hard to find good choices for appliques projects of fabrics with smaller prints. My favourites are tone on tone. A rainbow of colors always works for kids…and adults. Rainbows generally make people happy…and attract unicorns. Unicorns poop jelly beans. Jelly beans are sugar. Sugar gives energy to make quilts. Hmmm. Rainbow fabric = quilts. Yeah its after 1 am. Can you tell? I would make a quilt for my soon-to-be grandson!! Congratulations on your new fabric company, Patrick Lose Fabrics! Wonderful fabrics and wonderful thread to go with them. Congrats Patrick on your new fabric line and company. Thanks for the giveaway! I would love to make a quilt with these fabrics! Thanks for the chance to win! An absolutely luscious duo of thread & fabric! I would make a simple baby quilt, maybe squares…and let the beautiful fabric take Center stage. I love to use all the colours, i would mix these into numerous projects. I would also love to try more fmq with coloured threads on a white background. Beautiful thread set and beautiful fat quarters. I would make a gravity quilt for my daughter. Fun colors! I would use the colors to make the snowman from a book that I have of Patrick’s and some other fun spring and summer wall hangings! I am discovering “brights” and this would be so fun to stretch my creativity with! Thanks! Congrats Patrick. I think I would love to make a flying geese in a circle modern mini-ish quilt. New fabric for a new technique for me. Lovely colors! I love the new colors. They would look great on my daughters new King size bed!! I love Patrick’s fabrics and now there are threads that match. What a way to finish off a project!! I’m so excited to use them both!!! I have a new granddaughter coming soon and would make a beautiful quilt for her!!! Definitely making a Bargello quilt with these threads! You are so talented and I’m thankful you tapped into your given gift! I have a pattern called Lawn Darts that I purchased last year. It would be great in rainbow colors. I would like to make a rainbow quilt for an almost 3 yr old. I like the churn dash block, but I don’t design patterns, so will have to do a Pinterest search for one. The colors are so bright and vibrant. With all those colors there is a Bargello style quilt in the making. Love the colors and love Aurifil threads! They are the best to work with and a huge variety of colors. Love all the Beautiful Colors and would make Bags, Bags and Bags, 🙂 Thanks for the chance! His colors are always spot on! Love the collection. Would make quilts, quilts!!! I am a quilter so I would …make a quilt with this new fabric and thread! I love the bright colors! I love Aurifil! What a great combo. I’d like to design an original quilt to use these fabrics and threads. I have just the pattern in my stash – it’s called “Dotty” by Linda Warren Designs, and I could use some of the black & white prints, too. There are always quilts and bags and other things to make with these fabrics and threads. The colours are so inviting. Hard to choose! Probably a quilt or a couple bags! I love designs with high contrast or bright colors, so this would be perfect. The colors are just beautiful! I love the range of colors! I love sewing the rainbow, mug rugs, pillows, everything, love rianbows. What a wonderful giveaway and what beautiful fabric and thread! I would use these in a Storm at Sea quilt because to me those colours sing of the ocean. Love the colors and fabrics! Congratulations, can’t wait to see more. I would make a baby quilt for my new little grandson. I would turn those gorgeous fabrics into a quilt of some sort. Not sure what pattern yet, but I think they would make an amazing quilt. I love the thread and fabric. I would make a wallhanging or our bedroom. I would love to make my 1st bargello quilt with this beautiful fabric and quilt with contrasting colors of Aurifil thread. I have a rainbow quilt planned for ages and this fabric will be perfect for it! Thank you. This is such a great give away. You fabric is beautiful and the thread to match. I am your basic piecer. Love the quilt in the blog. When I hear the name Patrick Lose, I immediately think of snowmen. But I do love the bright colors of the new line and the thread too. Would make a wonderful play quilt for my first great grandchild due the first of March. I need to get busy! I’m getting another Grandchild this summer. This fabric would be so fun to use for a baby quilt! Living in Hawaii, where rainbows happen frequently, I would make happy kid quilts for our local community! Thanks for the giveaway! I would make bright happy baby quilts with appliqued animals on them. I love bright colors! Love your fabrics, perfect for several quilts I have planned. Also love to use them for applique, can always find the right color combinations. Thanks for the great giveaway. Love the fun loving colors and designs so easy to incorporate to projects! I’d love to sew a colour wash quilt out of this rainbow 😍 A bunch of triangles in graduating shades – maybe even Alison Glass’ tesselation quilt pattern? The possibilities are endless. I would love to use these colors in any of the quilt patterns I have for various whimsical animals. I think I’d make a Rainbow Bargello quilt! I would make more baby quilts for my grandkids, and throws for my mom and kids. Love making blankets. I would make a rainbow quilt for my granddaughter. The colors are gorgeous. Thank you for the opportunity to win. I’d make a lap quilt with this lovely fabric. I love the idea of the matching quality thread. Maybe I will be lucky! I want to make a rainbow quilt for my granddaughter. I love using Patrick’s fabrics and colors. I use rainbow fabrics to make quilted easter egg ornaments. I would use this wonderful rainbow of colors to make a new quilt to enter in one of the shows. I would love to use this rainbow of beautiful colors on an applique quilt. They colors are beautiful. I am so in love with his collection. I would make a quilt to hang above my bed. I’d love to do a rainbow bargello! I think these fabrics would be perfect! Great color! Thank you for the giveaway! You have great energy and it show in your fabric! Where do we find the post on the winner of these giveaways?? Awesome bright colors – I’m thinking of a nice colorful quilt.